In financial and economic circles, copper is often referred to as “Dr. Copper” for its ability to predict economic cycles. This, of course, is due to the ubiquity of the metal in modern life. But recent years have shown copper to be have such a significantly increase in volatility that it is questionable whether copper prices are reflecting the normal demand/supply equilibrium or whether this market is becoming yet another plaything in the hands of speculators. There has been ample discussion about the incredibly volatile commodity markets we’ve seen in the past 5 years - especially the crude oil market which spiked to a bubble-like crescendo of $145/barrel to then crash in the following six months below $40/barrel. If you missed, it, here is an interesting rebuttal to an OECD paper denying the role of speculative forces for the volatility in commodity markets. The US regulatory authorities seem to be taking this seriously but we haven’t seen any real changes, yet. And the chart below is courtesy of Bloomsbury Minerals Economics comparing the ‘notional’ price of copper (red dotted line) with the market price of copper (yellow solid line). The notional price is calculated by Bloomsbury based on production costs, inventory levels, industrial demand and currency effects - basically fundamental variables that normally effect price. This allows us to imagine what copper’s price would be like if the institutional investors and hedge funds had not infiltrated this small market. 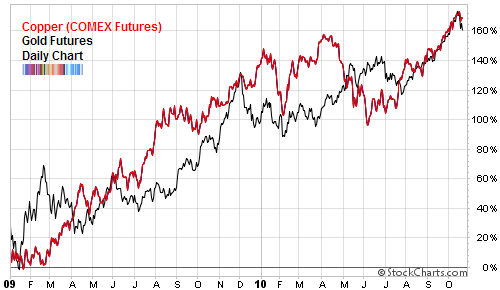 Based on this analysis, copper would be less than half the price it currently is trading on futures markets. Sadly, this throws out of whack the predictive abilities of copper for the world economy. With copper’s market price about to take out the previous highs, one would think that this is a sign of the recovery of the global economy. However, this may simply be a mirage manufactured by the traders who have no real intrinsic interest in the metal, other than as a speculative vehicle to provide returns. While I’m not suggesting that today’s copper prices as a bubble, they may be as fleeting as the oil prices we saw in 2008 and act as an exogenous ‘tax’ on the global economy in the same (but much smaller) manner. I’m basing this on not just the artificial price that Bloomsbury is suggesting but also on the fact that the recent CFTC data for the Commitment of Traders shows that commercial hedgers (considered the smart money) are now slightly more net short than they were in April 2010 and as net short as they were in January 2010. To balance the equation, the institutional players (Large Speculators) are now equally net long. In fact, they are at a peak, just as they were in January 2010 and April 2010. Both instances of horrible timing to be long. Since they are commercial hedgers, it is natural for them to be short. But right now we are seeing an extreme position that suggests they expect lower prices in the future. 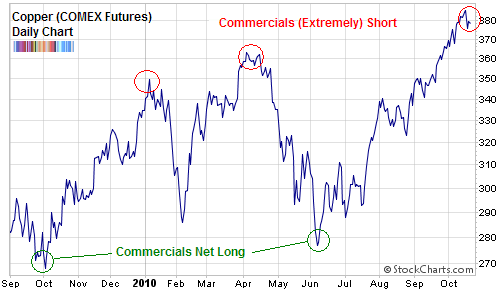 And to demonstrate their ability to correctly predict prices, it is very rare for these commercial hedgers to be net long but that is how they were positioned in October 2009 and June 2010 - both important inflection points as you can see in the above chart. I think the non-commercials wag the dog, so the commercials (which include dealers) just take the opposite side of the trade. So the non-commercials (specs) have shown reasonable timing. I’m still never quite sure though how paper transactions on Comex affect the price of a physical asset? I think this analysis is incomplete. Cancelled warrants, or orders to withdraw copper from LME warehouses, rose 23% alone this week. Copper stockpiles monitored by the LME shrank for the 36th week in a row this week, something not done for almost 6 years. Contrastingly though, copper stocks have increased in Asia. Freeport McMoran, the largest independent copper producer, yesterday said in their conference call that despite the overall negative economic environment, demand for copper is quite strong. I think that is very important to note. One of the largest producers of copper in the world is bullish on the copper market not only in the US, but also the rest of the world, especially China. There is a supply deficit of copper officially now. Perhaps the rise in net short postions is a warning, but to say that copper has somehow lost its predictive quality as an economic indicator I think is very premature. The best PREDICTIVE behavior I have seen is when there is a meaningful divergence between gold stocks and coppers stocks. In my research this works much better than the gold/copper ratio. One of my favorites is SCCO/ABX. When Barrick is outperforming usually there’s a turn coming. Sadly a lot of commodities have lost their relationship between notional and fundamental value (as you mentioned oil, gold ) and even the softs get caught up in speculative action quite often. The demand side-in the area I live in(not industrial) once in awhile I see semis with wind turbine blades. Someone must still be putting up wind electrical generation systems. Other demand would be electric cars which seem to be coming on strong(tax incentive) and that includes most of the world. Tax incentive in the US to upgrade the electrical grid and new electric generation power plants the world over being planned or built. These items mentioned would far out strip the lost of demand from the fall in home construction in the US and Europe. From what I read countries like China and India are still in the construction of residential and commercial buildings. Also the percentage of copper that can be recycled-I assume it is small per cent. When a car is recycled and melded down can the copper be saved or is it worth the effort?